Waah! Such beautiful words, many of you might have heard this song from the movie Aandhi. The rest of the song is also beautifully written with so many efficacies by the great Gulzar Sa’ab. Gulzar Sa’ab is a master of many such poems and shayaris. A literary gem, his songs confides the feelings of the humans from the innocence of a kid to the loss of a loved one and ultimately the acceptance of death. Sampooran Singh Kalra was the given birth name of Gulzar. He was born on 18 August 1934 in Dina, Punjab, British India. His family moved to India after the partition. 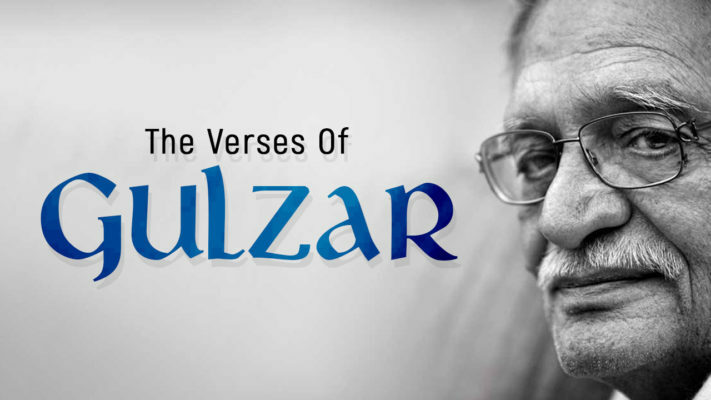 He used the pen name Gulzar Deenvi when he a became a writer and later shortened it to Gulzar. The Academy Award winner is a world-renowned Urdu poet, lyricist and film director, with a career spanning over 50 years and with fans from all ages groups. He started his career as a lyricist for the movie Bandini in 1963, with music director S.D. Burman, and later went on to work for many music directors and is still writing songs in present time, the latest ones being the songs from the movie Raazi. He received the Academy Award for the song “Jai Ho” which he shares with A.R. Rahman. He also directed many movies such as Aandhi, Mausam etc. and TV series such as Mirza Ghalib. Gulzar also wrote dialogues and scripts for many movies. He is a recipient of many awards such as Padma Bhushan (2004), the third-highest civilian award in India, the Sahitya Akademi Award and the Dadasaheb Phalke Award — the highest award in Indian cinema. He has won several Indian National Film Awards, Filmfare Awards, one Academy Award and one Grammy Award. Not many know this but before joining the industry he used to work in a car garage and he also had interest in painting. He used to write then also and took part in writing events. His passion for writing was not supported by his family members but he still took on the challenge and is now at the heights of the literary world with his songs, poems, shayaris, Ghazals and Nazms, catering to hearts of people of all ages. He married the famous actress Raakhee and has a daughter Meghna Gulzar, who is also a director. Tere Masum Sawaalon Se Pareshaan Hoon Main…. With this song from the movie Masoom, Gulzar sa’ab brings out the innocence of a child and the dilemma of a father. I remember my school days when we used to sing this song on Independence Day, this song would make us clear our conscience and boost our spirit. meri aawaaz hee pehachaan hai, gar yaad rahe..
A song with a deep impact, the lyrics are brought to life by the melodious voice of Lata Mangeshgkar ji. You need to listen to this song to feel it. These words are self-explanatory; it tells us to live life to fullest in the present moment, lest it passes away. For all the people struck with wanderlust, this song is for you. Pehle se Kya likha tha ? Surkh sunahari saahilon pe tum milo mujhe. Ye Pehle se navishta tha ya ittafaq tha. Shaayad kisike dard visarjan ko aayi thi. Us raat Chand bhi to bahut der se uttha. Mujhko sunnati bhi raheen aur phaadti raheen. Paani pe door door tak purze se bich Gaye hain. Rooh ko mahsus kiya hai? saans lete hue us kohre ko mahsus kiya hai? subkiyan leti hawaon ke bhi bain sune hain? apni gahnati hui kokh ko mahsus kiya hai? rooh dekhi hai kabhi, rooh ko mahsus kiya hai? ye gunah ham ne ek baar kiya. And hundreds of such Nazms, Shayaris, Songs and Ghazals have been written by this literary genius. Reading his work will definitely be an enriching and enlightening experience. Now Streaming: Why App Streaming Originals Have Failed To Capture The Telugu Viewership?